Happy Halloween, fellow crafters and DIY enthusiasts! 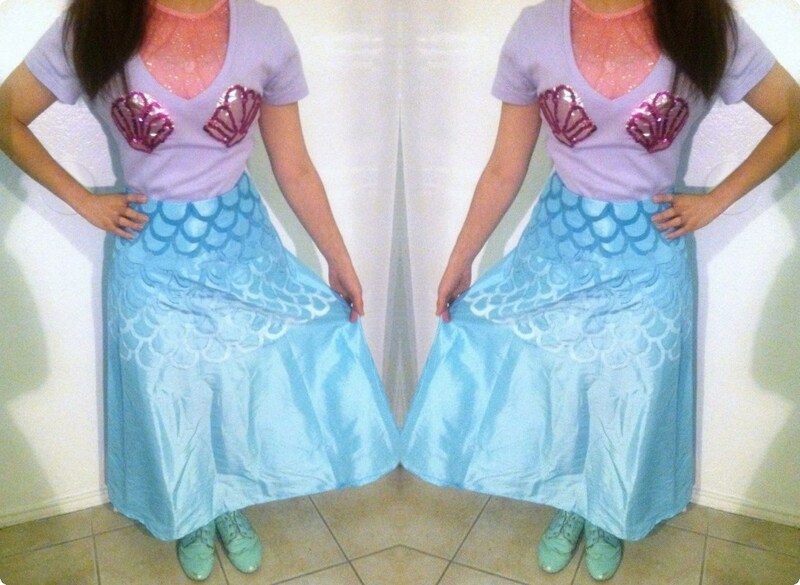 To share my festivities, I dressed up as a mermaid; to which, of course, I made my myself. Due to time constraints I skipped a visit to the fabric store and went thrifting instead. I purchased a lilac v-neck tee, a sky blue long length skirt, a shimmery iridescent pink mini skirt and a toddler's glittery pink skirt. 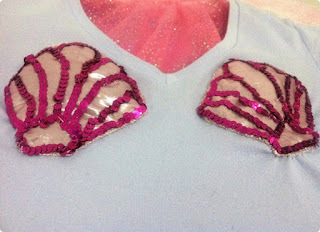 I cut out two sea shells patterns using the mini skirt fabric. Unfortunately, I did not have any interfacing so I improvised with some scrap fleece. 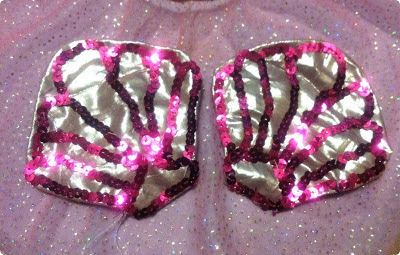 Sewed the two together by hand and embellished with pink sequins. Then strategically placed the shells on the tee before sewing them in place. 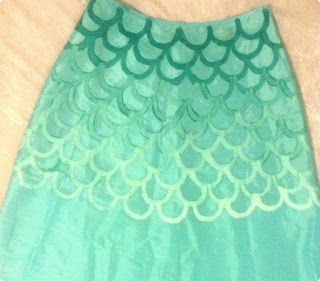 As for the long length skirt, I painted gradient blue acrylic with a scallop stamp to imitate scales. Lastly, I wore the toddler's skirt as a collar, tucked into the tee. Voila, my look is complete! Sources of inspiration primarily stem from Mermaidens. First, I absolutely adore her I'm a Mermaid dress! Then I incorporated a featured Mermaid Dress DIY post by Scathingly Brilliant to complete the look. Additionally, I very much appreciate these ladies for sharing and further motivating me to create my very own mermaid inspired look. DIY inspired design duo creating handmade and more. We enjoy being creative with our hands and are inspired to share our endeavors as we create at our leisure. Our outlook stems from a unique sense of originality, authenticity. Individuality is most supported and encouraged to innovate, inspire and foremost DIY. DIY inspired design duo creating handmade. We’re pleased to inspire those who share a Do It Yourself attitude; individuals who are creative and unique. As reference to DIY: Holographic Skirt , this is a circle skirt tutorial with a zipper and yoke waistband.